This paper describes our proposed virtual transportation system. Our proposed system is a display case for use at art museums, which is based on computer graphics and image-based rendering (IBR) techniques. Using this system, anyone can simply create and realistically represent virtual cultural assets. This system consists of two main components: a display unit and a capture unit. The display unit is in the shape of a conventional display case in order to represent virtual cultural assets. The capture unit, which is created by attaching cameras to a conventional display case, reconstructs cultural assets using IBR techniques. In our experiment, we implemented a basic system using View Morphing as the IBR technique. 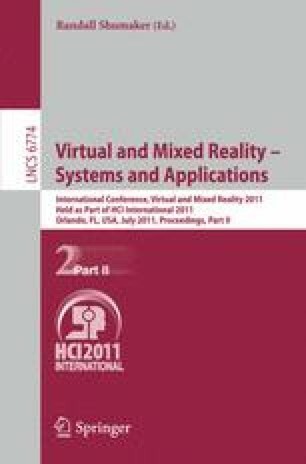 The results show that this system can represent virtual cultural assets as 3D objects on the display unit by using arbitrary view images that are interpolated by View Morphing.